Car insurance is one of the most important purchases you will make as an adult and as a driver. As a driver, you want to ensure that you get the best possible rate but still have the appropriate amount of coverage. Not always an easy task right? State Farm® Canada wants to make insurance easier for you and have been doing so since 1938. Quality service and relationships are at the heart of what State Farm® Canada does and now you can connect with them 24/7 via their mobile app. This easy to use app puts a lot of control into your own hands when it comes to your insurance. You can access the Telematics program, the Alert program and you can even manage your insurance and make a claim, all from your smart phone where and when you want to do so. The Telematics Program is connected to the mobile app and is the first fully mobile telematics program in Canada! You are probably sitting there wondering what is telematics and why does this matter to me? 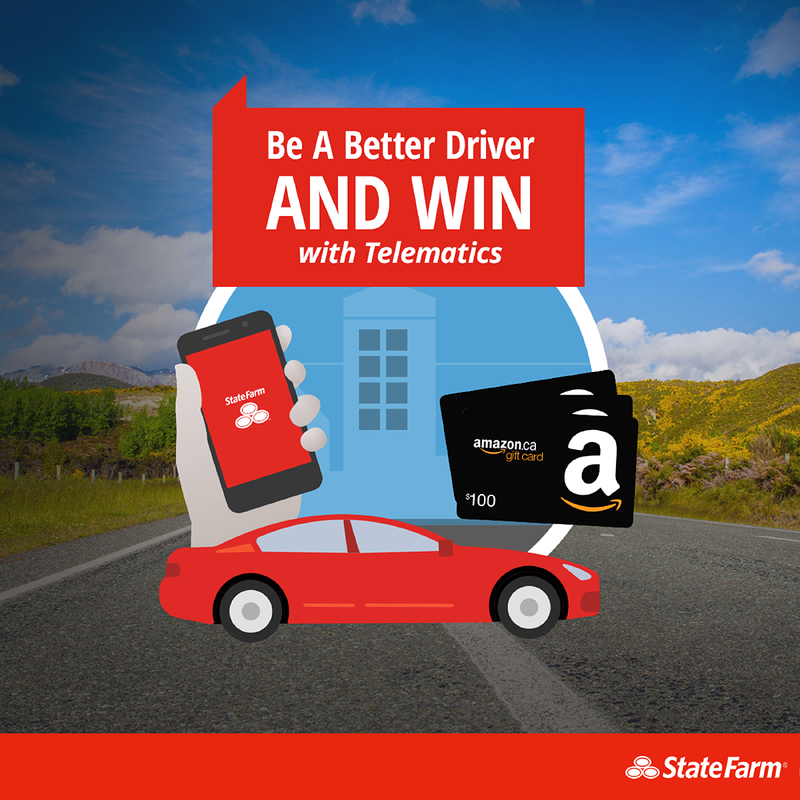 Telematics is State Farm® Canada’s usage based insurance program that allows you, the driver, to learn more about your driving habits and in turn rewards you with additional savings on your car insurance based on how you drive. It can monitor how you brake, start, speed and how much you actually travel. All of your good driving habits will add up in savings for you – you can save up to 25% on your car insurance, who doesn’t want to save that kind of money?! Signing up for the program is as easy as visiting the App Store or Google Play and downloading the app. Once the app is downloaded, you can sign up directly for Telematics and begin to monitor your driving. You can monitor your score in real time and it also helps to challenge you to improve your driving skills, who doesn’t love a good challenge? State Farm® Canada wants to reward you and encourage you to be a better driver with a fantastic giveaway! From now until July 31st, Ontario residents can enter to win 1 of 50 $100 Amazon gift cards! Entering is as simple as visiting the contest website, entering the contest and then downloading the State Farm Canada app. GOOD LUCK and happy driving! Disclosure: I received compensation for this post. All opinions expressed are my own. This entry was posted in giveaway, Lifestyle, technology.